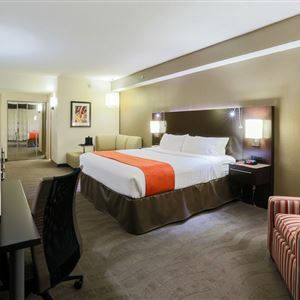 When you stay at Holiday Inn Austin Midtown in Austin, you'll be in the business district and close to Brentwood Park and LBJ Presidential Library. This hotel is within close proximity of Hyde Park Theatre and Antique Marketplace. Featured amenities include a 24-hour business center, complimentary newspapers in the lobby, and dry cleaning/laundry services. Planning an event in Austin? This hotel has 15000 square feet (1350 square meters) of space consisting of a conference center and meeting rooms. Free self parking is available onsite.